The U.S. Navy is searching for seven sailors after a destroyer collided with a merchant ship more than three times its size near Japan, according to the military. The USS Fitzgerald, an Arleigh Burke-class destroyer, collided with a much larger Philippine-flagged container ship 56 nautical miles southwest of Yokosuka, Japan before dawn Saturday. 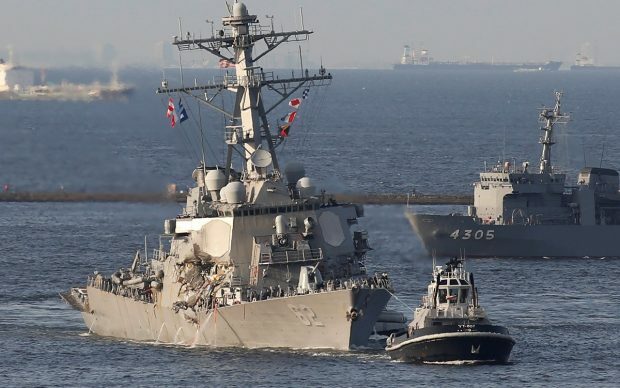 The destroyer, which took a hard hit to its starboard side, experienced “significant damage,” causing flooding, inhibiting communications and limiting its operational capabilities. The ship was able to operate under its own power but with limited propulsion. It returned to port with assistance. The container ship is docked in Tokyo Bay. None of the crew members were injured in the incident. The guided-missile destroyer is now at Yokosuka Naval Base, where the damage is being evaluated. A massive search is underway for seven U.S. military personnel that went missing after the accident. Three of the destroyer’s crew members, including Commander Bryce Benson, were medically evacuated to the U.S. Naval Hospital in Yokosuka. Other injured persons were assessed and treated onboard the ship. U.S. and Japanese ships continued searching well after dark for the missing sailors. The USS Dewey and several Navy aircraft will work with the Japanese Coast Guard to find the missing crew members. It is unclear what caused the crash, and the incident is under investigation. Accidents are more likely in busy seaways. A U.S. naval vessel collided with a South Korean fishing ship in May. President Donald Trump is aware of the incident. The USS Fitzgerald received $21 million in upgrades in February. The destroyer was deployed to the Asia-Pacific region to provide additional stability through America’s persistent military presence.